Lincolnshire-based young Texel breeder Tessa Bustance is quietly making a name for herself in East Anglian sheep circles as a producer of quality commercial rams. It is a focus on this local commercial market and a determination to produce tups from mainly forage-based diets which is paying dividends for her Eaubrink flock. 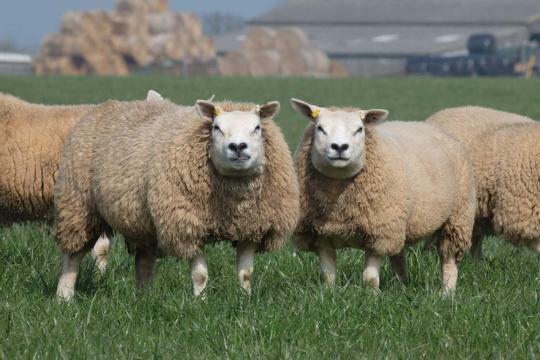 Having established the flock in 2010 with five ewe lambs from the Ashley family’s Lincs flock, numbers stand at 60 ewes, with expansion largely having been home grown, with the exception of 10 females bought from Simon Rogers’ Decoy flock prior to its relocation to Cornwall. She says: “I had commercial ewes before, but wanted a bit more of a challenge, to produce something I could be really proud of. Texels fitted the bill as they are a breed with a large market and a lot going on too. Tessa’s initial 15 ewes were joined by Haltcliffe Rhapsody and Matthews Rocket Man, both from the Ridley family’s flocks at Hesket Newmarket, Cumbria, and both sourced from the Solway and Tyne Club sale at Carlisle. Keen to promote her flock, Tessa has been active in Eastern Counties showrings since the start, regularly competing at the Lincolnshire and the Royal Norfolk County Show, winning the championship at both in 2013 and at Norfolk in 2015. “If I’m honest, showing was part of the reason for starting with Texels and it’s something I enjoy a lot. Rams are sold from home and at the NSA Eastern Region sale at Melton Mowbray, as well as offering a small number at the Solway and Tyne Club’s first sale at Carlisle in September. “At Melton Mowbray last year, I sold 10 shearlings to average more than £600. In 2016 I sold 20 shearling tups in all, with the pen at Melton Mowbray topping at 950gns and averaging more than £700. Lambing in mid-February, the flock is housed about 10 days ahead of lambing, while both ewe and ram hoggs remain out all winter, initially on grass keep on a local dairy farm and latterly on stubble turnips. “Most of the ewe hoggs will never see concentrate once they come off creep feed as lambs. The only ones which will are the few I select as potential show sheep. Likewise, the shearling rams are not fed until about six to eight weeks before the sales, growing at grass for most of spring and summer. “Hopefully, not having been fed large amounts of concentrate means they will perform better in commercial situations and mean they last longer, which is beneficial for our customers,” says Tessa, who runs the flock with the help of her boyfriend Tom Skinner. Feeding is equally sparing for the ewes, with a small amount of concentrate introduced in the 10 days before ewes are housed and continued for a few weeks after lambing until grass growth pushes on. Recent years have seen the addition of sires from the Cowal, Cairnam, Far Hey and Thacka flocks, with these again bought for their size, length and carcase characteristics. After lambing, ewes go out to grass again within about 10 days and creep is introduced to lambs at about four weeks old. Looking ahead, Tessa says the aim for the flock is to continue to develop the trade for commercial shearling tups and potentially begin selling drafts of shearling ewes each year too. “With the flock now at a number I feel is right, there is an opportunity to start selling a few shearlings each year and again there should be a good demand for the right sort of ewe. “I have sold a few at the Solway and Tyne Club sale in the past and would like to build on this in future years. It is likely we’ll have a few to sell each year, with the flock relatively young and not wishing to expand much further at the moment,” explains Tessa.